First...I love the look of this pendant. I purchased it to for my closed in back porch and it really does look perfect and was the look I was hoping for. I sure wish I had the room to hang all three sizes but my small townhome doesn’t allow for that. The one negative was that while packaging wasn’t damaged in any way the orb had three rips which I had to patch with some clear packing tape. If this had been for the inside of my home I would have returned but because it’s on a porch I decided to not go through the hassle and live with it. All in all it’s a unique and interesting fixture that’s perfect for the look I wanted. 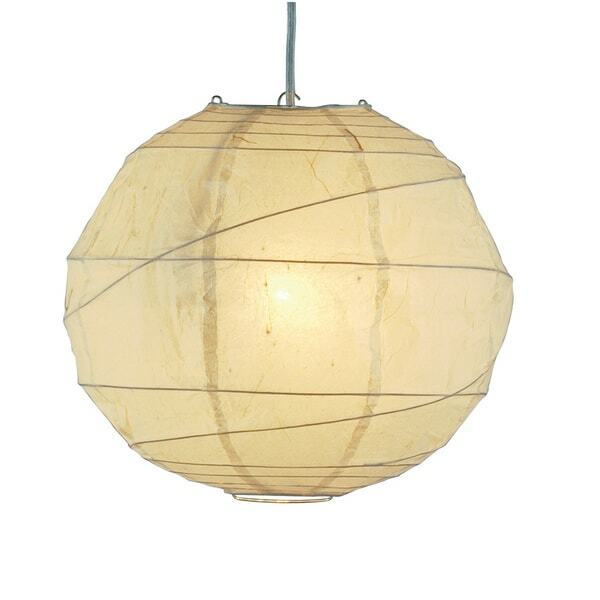 Natural round rice paper and collapsible shades with uneven bamboo ribs complete this unique 1-light orb pendant. Includes 15-foot cord with socket and hanging apparatus for easy assembly. Use this Orb plug-in pendant as part of a living room or bedroom lighting display that includes collapsible shades of varying shapes and sizes. Purchase different colored 60-watt incandescent light bulbs to add a fun, festive feel to the space, or fill each pendant with a white light to create a more traditional decorative ceiling arrangement. Nice latterns. I bought the three sizes. As I was hanging them, I dropped this medium one and it tore; likewise for the small orb which did not tear. (I was very careful not to drop the large orb.) Overall, nice look but there I since found other latterns that were a much better value. And for the price - the med orb was too fragile - frankly the paper seemed less consistant and lighter wieght than the other orbs. All you need is a light socket on a cord and a paper lattern to make this light fixture. The orb adds the whimsical look I wanted. It is slightly off-white & gives off a soft light. I decorated the electric cord with a cloth cord cover. I'm completely satisfied with the light. The only disappointment was that I paid for expedited shipping & it came FIVE weekdays later-not the agreed upon date I paid extra for. This pendant is really striking! I have it hanging over my family game table and it gives a nice soft light to the whole area. The packaging and instructions were good. I would give it 5 stars, but there are a few places where the paper is dented in a little, probably the wires got bent a bit in packaging. Not a big deal at all since this is a delicate material so some denting is bound to occur. The cord is a nice silvery/clear which is not too obvious and that is good. Overall a really fun and striking light! I bought 3 of these for my bedroom - with a soft white LED light that emits 60 watt. You will see the wire going up your wall if you don't mind that. The light projects from top and bottom and very nice diffused warm biege from its sides. Really brighten the room wo being obnoxious. Light, airy, perfect. Comes with all the hardware needed to hang it, however i opted to add an additional hook to hang the extra cord from as it is quite long. I would buy this again. Purchased the medium size and it was larger than I anticipated. This is a sand color not as shown. While putting the metal pieces in to open orb the light fixture area was broken. I had to tape it together to get it to hold. I am very disappointed with it. Just can't afford more money right now. You get what you pay for. It's a bit bright for any kinda night light but for a light you want by the bed to read your book its perfect. I ordered 6 of various sizes to make a chandelier-type fixture. Two of them came with small tears in the rice paper. Everyone who has seen the result loves it. Put 1100 lumen LED bulbs in them and they give out lots of good light. Looks nice, works well, the medium size is huge. Wish I had ordered a small size. It looks kind of cheap I think. The paper has turned brown - like rusty almost - where it meets some of the wire. I'm sending it back. Nice large paper lantern with a long wire. These are beautiful! I haven’t got them up and hanging yet, because I’m not very handy and they require some time. But I’m excited to add them to the new decor in my children’s room. Just as described and looks great in the den! I ordered two of these. I liked the price and they really brighten up a fairly dark bedroom. This thing is HUGE. I have it in the corner of my living room and it looks so great. Gives the perfect amount of light and really adds such a coziness to my space. Cute fun lamp and a great price! It's a fun simple inexpensive thing we purchased that adds warmth and fun to our decor. Made well for the price. I like the random looking lines. Great look. Hanging over my computer desk. "Where is the switch on this cord? Near the plug or near the light? Near the plug is pointless if you need the light further from the plug." "How long is the cord?" "I see the large is 24 inches.. Can you give me measurement of small and medium?" Hello mattyisshopping, the small is approximately 14" inches in diameter. The medium is approximately 19" inches in diameter. Please let us know if you have additional questions. Thanks for shopping with us. I ordered this in the size large , to large for my hall, so used other lager one in my voltied celling in Den. Liked it so hoping it will be small enough for hall way entering my master Bed Room. "Flammable? We bought two and love them, but now we've been told by two separate electricians that they're a fire hazard. Even with 60w bulbs. Can you explain how the bamboo/rice paper combo has been made fire-resistant, or is otherwise non-flammable? Thanks!" Hello gregcal, being certain the bulb does not come in contact with the shade is a good rule of thumb. Using a low wattage bulb, and never exceeding the lamps recommended wattage as well. I hope this helps and thank you for shopping with us. "Does it plug in a wall outlet"
Hello royboy1015, yes this would just plug in to a wall outlet. Have a great day! "what diameter is the large?" Hello Catcat, the large has a 24 inch diameter. Thank you for shopping with us!